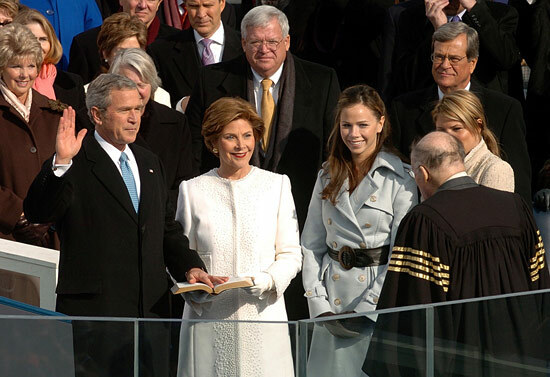 George W. Bush takes the Oath of Office during Inauguration ceremonies in 2005. This is the angle many photographers want of the Inauguration of Barack Obama, but very few will actually get it. The upcoming inauguration of President-Elect Barack Obama is drawing unprecedented interest from the public and the media. The last inauguration in 2005 drew a few hundred thousand people. Some estimates for January 20, 2009, go as high as four million – possibly filling the entire National Mall from the point where Obama takes the oath of office at the Capitol to the spot of Rev. Martin Luther King Jr.'s “I Have a Dream Speech” at the Lincoln Memorial more than two miles away. Media interest is off the charts. Many journalists will be documenting local groups making the trip to see the historic event while others will be traveling to Washington, DC, on their own while others will be doing what they do every four years – covering yet another inauguration. The harsh realities are that getting into a credentialed area to have a view of the swearing-in is a long shot, housing is non-existent, transportation will be difficult, walking won’t be much easier and the weather is unpredictable. Credentialing for the day is divided between two groups, the Joint Congressional Committee, which oversees the swearing-in at the Capitol, and the Presidential Inaugural Committee (PIC) which oversees pretty much everything else that day – the Inaugural Parade in the afternoon and the official Inaugural Balls that night as well as any official galas or celebrations earlier. Photographers wanting credentials to cover some specific portion of the events will need to contact the proper committee while those who just want to be in the crowd in unsecured areas will only need to show up and start making pictures – no passes required. As far as still photographers go for the swearing-in, the Senate Press Photographers’ Gallery is responsible for credentialing, assigning spaces and then marshaling everyone on January 20. The Gallery has already received four times the number of requests it has for any past inaugural. They are working to fill as many of the requests as they can but you have to look at the facts and realize the odds are extremely long if you make a request to the Gallery for a spot to photograph the swearing-in. There are fewer than 100 positions available on the risers and priority is given to organizations that have a history of covering inaugurations over several administrations and regularly cover Capitol Hill -- so you can assume 90 percent or more of the spots are already taken. Throw in priority of local papers and national outlets with far reaching readership and there are very few spots, if any, available to those who want to cover an inauguration for the first time. The Gallery has received more than a thousand requests and simply do not have the space to fill them. If things work out as they did four years ago, anyone who gets approval for a credential in the secured area -- including the press risers -- will have to make an appointment with Capitol Hill Police to have a security check done. This must be done in person and well in advance of January 20. Four years ago the cut off for security was more than week before so you couldn’t just come in a day or two early and stay. You have to plan a second trip into your schedule and budgeting as well. As of Thanksgiving the Presidential Inaugural Committee (PIC) had not started registration for media for their events. So, if you want to come to Washington and don’t get official credentials what are your options? Luckily in this case the answer is limitless. With the number of people coming to partake in the festivities of the day there will be tons of stories to photograph, and frankly there are probably better images to be made away from the podium. Yes this is a historic moment, but the swearing-in is still a staged picture and except for the participants it is the same photo made every four years. If you are a student or young photographer looking to expand your portfolio and impress editors, I would not want to see that you covered the swearing-in because I know that you were in a position the was set to give you an angle for the action, and everything was scripted. But the emotion that will be present in the faces of people out on the Mall and the parade route as they experience this day will make for stronger, more personal images. I would suggest you find someone for whom this day has personal meaning and stick with them. Look for the pride or tearful moments that happen when Obama is sworn in or the excitement when he passes by on the parade route. The biggest obstacle to covering the event will be getting around Washington. Driving will be practically impossible and the Metro subway trains will be crowded so add extra time to every movement you plan on making. Metro is opening at 4 a.m. on Inauguration Day and they are asking anyone who is staying within two miles of the Capitol to simply walk. But walking won’t be much better as it will be like four years ago with an expanded security perimeter. In 2005 the parade route required a trip through metal detectors and that should create long lines of people wanting to be along Pennsylvania Avenue. Also with the large crowds many attending will have to decide whether to go to the Mall for the event or stake out a spot along the parade route early. Those who try to go from the Mall to the parade will find they are backed up at security and if they make it through in time they will be trying to see through a large crowd already against the fences. While most of the parade route is open to the public, and therefore photographers as well, you do need a credential from PIC to be on one of the press risers along the route or anywhere in the last block of Pennsylvania Avenue from 15th Street to the White House where there is the main, credentialed press stand. It is up to the president as to whether he wants to walk at any time along the parade route so he could opt to do like Jimmy Carter and walk the entire route or stay in the car until he gets to his secure reviewing stand in front of the White House. That means there is no spot along Pennsylvania Avenue where a picture of him is guaranteed. Because of the tight credentialing and security zones many photographers who travel to DC to document the day will never see the new president. So if you are coming be prepared for that result.